FÉGARMY Arms Factory (FÉG) of Hungary started producing Walther PP/PPK clones in the late 1940s starting with their Model 48 which differed from the Walther PP only in minor details. By the late 1950s FÉG began making broader changes resulting in the PA-63, which uses the 9×18mm Makarov round. It quickly became standard issue to both Hungarian military and police forces. The military standard PA-63 version sports a two-tone polished aluminum frame with black slide, grips, trigger and hammer assembly. While unusual for military issue in that a reflective polish was used, it was chosen due to its relative cheapness as well as quicker build time. 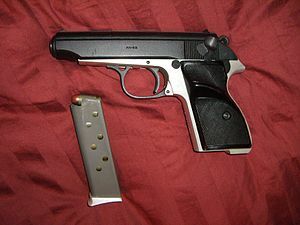 After the fall of communism in 1990, the Hungarian army and police units initiated a program to replace the PA-63 with pistols using the NATO-standard 9×19mm Parabellum cartridge, first the imported Jericho 941, followed by the domestically produced P9RC, but the PA-63 is still in service in Hungarian law enforcement. It has been largely phased out in Hungary, but due to the large number produced, they are a popular and affordable surplus firearm since they have begun to be imported to the west. Due to the PA-63's popularity and relative durability, FÉG later issued models using .32 ACP and .380 ACP caliber rounds, the FÉG AP7.65 and PMK-380 respectively. The AP7.65 is almost identical to the PA-63 except that it is chambered in 7.65mm Browning (.32 ACP) and is anodized not two toned. The PMK-380 is chambered in the .380 ACP cartridge with a blued titanium-aluminum alloy frame and blued steel slide. In 2000, FÉG began producing the Walther PPK/E under license from Walther. It is available in .22 LR, .32 ACP and .380 ACP. PA-63s sold in the United States are often advertised as "PA-63 Makarov." This can lead some consumers to believe they are purchasing a Makarov pistol instead of a different pistol chambered for the same 9×18mm Makarov caliber. Though both pistols share lineage from the Walther PP/PPK, similar operating principles and use the same ammunition, the Makarov PM is a different design featuring all-steel construction and different lockwork. There are no parts in common between the FÉG PA-63 and the Makarov pistol. ^ a b c Cutshaw, Charles Q. (28 February 2011). Tactical Small Arms of the 21st Century: A Complete Guide to Small Arms From Around the World. Iola, Wisconsin: Gun Digest Books. p. 86. ISBN 978-1-4402-2709-7. Retrieved 10 July 2013. ^ John Ivor Headon Owen (1976). Warsaw Pact Infantry and Its Weapons: Manportable Weapons and Equipment in Service with the Regular and Reserve Forces of the Soviet Union, Bulgaria, Czechoslovakia, German Democratic Republic, Hungary, Poland and Rumania, and of Yugoslavia. Brassey's Publishers Limited. p. 34. ISBN 978-0-904609-03-5. ^ "Makarov.com - Other Pistols". Retrieved 9 May 2012. Hogg, Ian V.; Walter, John (2004). Pistols of the World. David & Charles. ISBN 0-87349-460-1. Hartink, A.E. (2003). The Complete Encyclopedia of Pistols and Revolvers. Edison, New Jersey: Chartwell. ISBN 0-7858-1871-5.